LabPrints is proud to be a sponsor of the special summer seminar mini tour, "LIGHT, CAMERA, PROFITS." 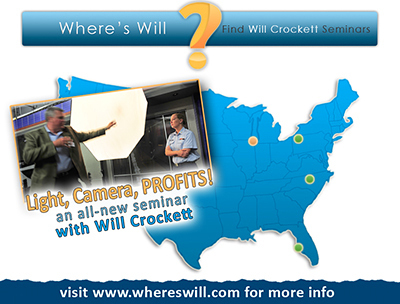 We think it is the absolute best and latest info on how to shoot smarter instead of harder--with photographer, author, ShootSmarter.com chief tech writer, and photo consultant to the US Military: Will Crockett. Those of you who have seen Will's programs before know he pulls no punches, is great at sharing his tips (and in an entertaining way), and can easily shoot a client assignment in JPEG or RAW that needs zero adjustments to make a smokin' print sent to his lab using LabPrints! Will travels to 4 cities this summer with his own personal lighting, shooting, computer and even wide format printing gear to show you exactly how to become a more efficient, confident, and profitable photographer. This new program moves you up a pay grade to reveal as many answers and shortcuts as possible to increase your profits while decreasing your time and frustration. Will's style of premium quality imaging with unusual ease in producing the final file or print in the least amount of time is why he has been chosen over all others as the "trainer" for the staff of photographers inside the Pentagon. Will's latest picks for best on-camera and off-camera flash. Premium studio strobes...worth the bux? Why or why not? Our new ShootSmarter "Top THREE" monobloc/ compact strobes. In-camera tools and tips for setting the best capture possible. Will's TOP FIVE money makers - tools that work for you everyday. Event coverage with one flash and two. The best wireless triggering options for TTL and non-TTL lighting. File storage, painless backup solutions both offline and online. B&W quality simplified and "profitized"
Admission is $39. And as with ALL Will Crockett seminars, if you join us and don't think it was worth your time or money you get a full refund. Why? Because the info is THAT good! So visit whereswill.com for the latest dates and locations, and join us on a Sunday afternoon from 12:30pm to 5pm and learn the best quality pro level and "emerging pro" level info available from one of the top digital photo experts in the world (and he's a lot of fun too! ).